Using the Eno River State Park Rock Kits prepared by Dalhya Lusk, Eno State Park Intern (Summer 2005) and Phil Bradley, NCGS. Beginning note: This guide was prepared using the Eno River State Park Rock kit. When a reference to a sample is made (ex. Sample 2) the participant is directed to that sample as an example of the rock type or process being discussed or described. The Eno River flows across rocks of two basic rock types. 2) Younger, less resistant, not metamorphosed sedimentary rocks (approximately 225 million years old) and younger resistant intrusive rocks (200 million years old). Examples: sandstone – sample 10 and diabase – sample 11. The older, very resistant rocks of volcanic and intrusive origin are present along the Eno River from it’s headwaters in northern Orange County to just east of West Point on the Eno Park in Durham County. The younger, less resistant, sedimentary rocks and resistant diabase are present east of West Point on the Eno Park to were the Eno River flows into Falls Lake (Figure 1). Eno River State Park is located in area dominated by the older volcanic and intrusive rocks. There are small dikes of the younger intrusive rocks (diabase) in the Park, however they constitute only a very small portion of the type of rock exposed in the Park. Figure 1: Map showing areas underlain by the older volcanic and intrusive rock (the Carolina terrane) and younger sedimentary rocks (Triassic basin). The rocks exposed along the Eno River from the headwaters to West Point on the Eno Park were once part of a volcanic island arc. 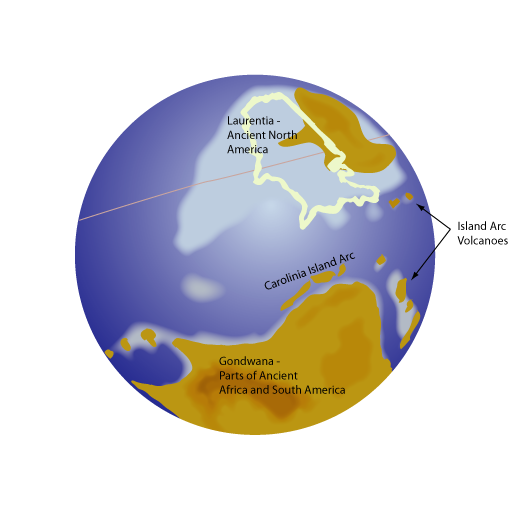 This volcanic island arc formed off the coast of the ancient continent called Gondwana (Figure 2) hundreds of miles from ancient North America (Laurentia). Gondwana included portions of the present day African, South American and Antartica continents. The island arc formed in an oceanic-oceanic crust convergence zone. One oceanic plate was pushed under the other and was forced deep in the earth into the mantle. During the subduction of the oceanic plate a portion of the mantle began to melt (Figure 3). This melting formed magma that slowing rose to near the surface (within 1-5 miles) of the sea floor settling in magma chambers all along the length of the subduction zone. Figure 2: Sketch of the Earth approximately 630 million years ago when the Carolinia volcanic island arc was active. Figure 3: Diagram of an oceanic - oceanic plate convergence zone showing subduction trench and volcanic island arc. Above the magma chamber the earth began to bulge and swell as underwater mountains began to emerge from the ocean floor along the length of the forming volcanic islands (Figure 4). Evidence of ocean (marine) sediments are found along Morgan Creek in Chapel Hill and in areas further south (sample 1). Figure 4: Cross-sectional sketch of a volcanic island. The piles of volcanic debris built up high enough that volcanic islands began to break the surface of the ocean. More eruptions followed building the islands larger and larger. (Evidence of above water (subaerial) volcanic eruptions is present as 1) red colored lavas and tuffs– air oxidized (rusted) the iron content of the lavas and tuffs as they erupted on the surface of the volcanic islands and 2) welded tuffs – as hot ash is erupted from the volcanoes the as remains hot enough (>500 degrees Celsius – If the ash was deposited underwater the temperature would not have been able to have remained elevated above 500 degrees Celsius and no welding would have occurred) that when it settles down on the land the ash grains stick to each other and become welded. This produced a very hard rock with distinctive characteristics. As these volcanic islands emerged above the ocean surface, erosion began working on their destruction. Existing volcanic and intrusive rocks were eroded and the resulting sediment was carried down the steep sides of the volcanic islands into the sea. The eroding of the islands is evident in a rock type named conglomerate (sample 6). Conglomerate is a sedimentary rock that is composed of rounded to partially rounded gravel and sand sized clasts. The clasts in sample 6 consist of tuffs and lavas and granodiorite. At the same time that the volcanoes were eroding, they were still actively erupting ash and lava. As such, the conglomerate and other rocks that indicate erosion are interlayered with the volcanic tuff sand lava flows. Sample 6 was collected from the Wilderness area of Eno River State Park. Past geologic investigations (Newton, 1983) in the Eno River area have interpreted that the volcanic debris exposed today in the Eno River area was part of a larger volcanic center on top of a large magma chamber. This magma chamber of molten rock may have been at least 27 miles by 8.5 miles in size and may have erupted in great cataclysmic eruptions as the magma chamber emptied of a majority of its contents. The empting of the magma chamber would have formed a large void underground and caused the ground surface to collapse into a great depression called a caldera that would have had similar areal extent as the former magma chamber. The caldera that may have formed after the eruption of the rocks in the Eno River area has been named the Hillsborough Caldera. The ash and volcanic debris ejected from the great eruption rained back down on the land forming thick sequences of volcanic ash and with the debris from subsequent eruptions slowly filled the caldera. The volcanoes that produce large calderas formed after huge cataclysmic eruptions are sometimes called supervolcanoes. The Hillsborough Caldera interpreted to have been at least 27 miles by 8.5 miles was probably to small tohave been considered a supervolcano. Yellowstone National Park sits in a giant caldera that is 47 by 28 miles in diameter. Past eruptions of Yellowstone have been considered as supervolcanoe eruptions. After several hundred thousand years, the Hillsborough Caldera resurged (came back to life). New magma began to enter the former magma chamber, pushing magma up higher into some of the ash and other volcanic deposits from the previous eruptions (Figure 5). (Evidence of resurgence is the presence of large bodies of solidified magma of intrusive rocks called plutons of the rock type granodiorite (sample 7) and diorite (granite-like rocks). The magma intruded the overlying volcanic rocks and cooled very slowly forming individual mineral grains that are visibile with the naked eye. Holden’s Mill, The Sakori and Ridge, and Cox Mountain Trails all traverse over granodiorite and diorite rocks. Figure 5: Cross-sectional sketch of a resurgent Hillsborough Caldera. The Hillsborough Caldera would have been similar, but smaller in size, to the large (28 mile by 47 mile) Yellowstone Caldera in Yellowstone National Park. The Yellowstone Caldera is in the process of resurging in which water heated by the resurging magma is responsible for the well known geysers (Old Faithful), hot springs, fumaroles, and mud pots. The Hillsborough Caldera, similar to modern day Yellowstone, would have had abundant hot springs were hot water, heated by the magma, circulated through the previously deposited ashes and volcanic debris. The hot spring (hydrothermal) activity extracted silica and other minerals and elements from some rock types or added silica to other rock types forming hydrothermally altered rocks. Evidence of hydrothermally altered rock is present in the pyrophyllite (sample 8) deposits associated with Occoneechee Mountain. At Occoneechee Mountain, hydrothermal fluids removed silica from the ash deposit. The altered ash was later metamorphosed, into the pyrophyllite. The End of Volcanism in the Hillsborough Caldera Area and the Collision of the Volcanic Island Arc with another Island. Following the resurgence of the Hillsborough Caldera, volcanic activity appears to have decreased and ended approximately 610 million years ago in the Eno River area. The volcanic islands were eroded and slowly sank beneath the sea. Following the Virgilina Deformation a new chain of volcanoes began to form to the west of the Eno River area. The rocks of the Asheboro area and to the southwest into the Uwharrie Mountains and Morrow Mountain State Park area are part of an approximate 550 million year old volcanic island arc. The rocks of the Uwharrie Mountains and Morrow Mountain State Park are younger but very similar to the rocks of Eno River State Park area. These volcanoes, like the volcanoes of the Eno River area went extinct and were eroded and sank beneath the ocean and were covered by marine sediments. As this renewed volcanism was taking place in the Uwharrie Mountains, the volcanic island arc that the volcanoes were riding on was slowing traveling toward the Ancient North American coast. By 450 million years ago the island arc was in the process of slamming into (accreting with) ancient North America. Approximately 450 million years ago, the volcanic island arc that included the Hillsborough Caldera and the Uwharrie Mountains slammed into Ancient North America forming a coast range set of mountains (Figure 6). The rock layers were deformed into large anticlines and synclines and metamorphosed. Figure 6: Diagram showing volcanic island arc (Carolina Zone) colliding with ancient North America. Off to the Southeast, out in the ancient Atlantic Ocean (called the Iapetus Ocean by geologists) the ancient African continent was approaching (Figure 7). Approximately 300 million years ago the ancient African continent slammed into the Ancient North American continent forming the 1000 mile long (from Newfoundland to Alabama) Appalachian Mountain chain and the supercontinent Pangea (Figure 8). Figure 7: Diagrams showing the volcanic island arcs of the Carolina Zone accreted to ancient North America and collision with the ancient africa portion of Gondwana with ancient North America (Laurentia). Figure 8: Sketch of the supercontinent Pangea. 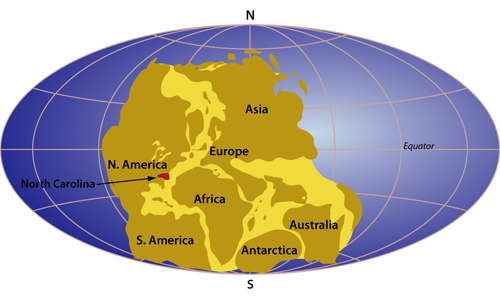 When the Supercontinent Pangea began to split apart approximately 245 million years ago, a system of rift basins (similar to the modern day East African Rift system) were formed all along the east coast of North America (figure 9). Called the Newark Rift System, the splitting apart of Pangea formed the Atlantic Ocean and several inland fault bounded rift valleys. The faulting that occurred during the split-up of Pangea formed many large and small faults. Often the faults were zones were silica rich fluids traveled. With time the silica in the fault zones precipitated out and formed thick quartz lined fault zones or fractures. One of these thick quartz zones is present running through Cox Mountain and is evident by the presence of whitish colored quartz (sample 9) boulders and cobbles strewn along the ground in a northwest trend. Land to either side of the rift basin began to erode rapidly filling the fault bounded lowlands with sand, silt and clay. The deposits of sand later turned into the red to maroon colored sandstones (sample 10), siltstones and claystones common in the basin. Rocks associated with the Durham Triassic basin are exposed along the Eno River east of Roxboro Road. Figure 9: Sketch of rift basins along the Atlantic Ocean. During the Jurassic (approximately 195-205 million years ago) dikes and sills of mafic composition intruded the sediments of the Triassic basin and surrounding crystalline rocks. This rock is known as diabase (sample 11) and more resistant than the surrounding sandstones and siltstones and often forms resistant ridges in the Triassic basin. Penny’s Bend on the Eno River is underlain by diabase. Diabase is composed of minerals that contain abundant iron and magnesium in comparison to the Triassic sediments. Because of the abundance of iron and magnesium, unique plant communities sometime develop on top of areas underlain by diabase (e.g. The diabase glades). As Pangea continued to split apart, erosion immediately began wearing down the mountain highlands. From the beginning of the Triassic to the end of the Cretaceous periods, the great mountain range was eroded down in approximately 170 million years. 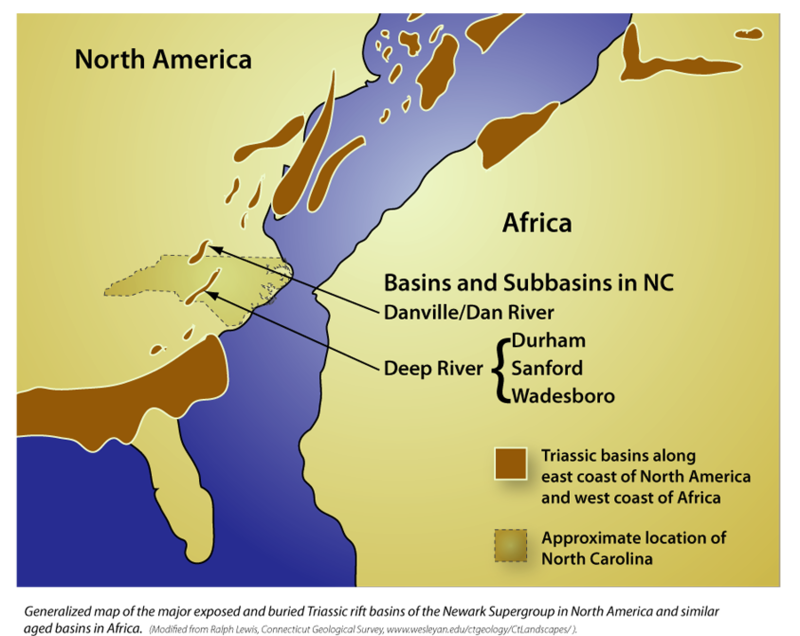 The mountains were essentially broken down into sand, silt and clay and transported along streams and rivers to the east and were deposited on the newly forming coast of North Carolina. The sediment was deposited in layers starting in the Jurassic period and continues today. These sediments make up the Coastal Plain portion of the State. The Coastal Plain is an east-dipping wedge of sediment that is only a few feet thick just east of Raleigh but thickens to more than 10,000 feet below Cape Hatteras. Millions of years of erosion had leveled the landscape to a nearly flat plain with gently meandering streams and rivers. As Cenozoic uplift began, the streams and rivers became entrenched in their floodplains. This entrencement of the rivers caused the rivers to down-cut and become incised in their channels as the land surface slowly uplifted. The Eno River is an incised river with steep banks in many places. Erosion is continuing today along the Eno. The sand, silt and clay deposits present in the river bed of the Eno are slowly making a long journey toward the Atlantic Ocean. During flood events, as the water level rise, sand, silt and clay particles are transported over the river banks and are deposited. These deposits are know and Alluvium – flood plain deposits (sample 12). Alluvium is the youngest geologic unit within the Park. Someday the sand, silt and clay material that compose the alluvium will be deposited at the mouth of the Neuse River near the coast and if buried deep enough will become sandstone, siltstone and claystone. During the next mountain building event these rocks may be pushed up into mountains and be eroded away, starting the whole process over. Hibbard, J., Stoddard, E.F., Secor, D., Jr., and Dennis, A., 2002, The Carolina Zone: Overview of Neoproterozoic to early Paleozoic peri-Gondwanan terranes along the eastern flank of the southern Appalachians: Earth Science Reviews, v. 57, n. 3/4, p. 299-339. Glover. L., Sinha, A., 1973, The Virgilina deformation, a late Precambrian to Early Cambrian (?) orogenic event in the central Piedmont of Virginia and North Carolina, American Journal of Science, 273-A, 234-251. Newton, M.C., 1983, A late Precambrian resurgent cauldron in the Carolina slate belt of North Carolina, U.S.A., M.S. thesis, Virginia Polytechnic Institute and State University, 89 p.